SUMMARY: Another product to light up your PC’s abode. There’s a pair of items I’d like to add to the “Features”; Low noise, and Good airflow. keeps the noise level low. The CC light lead measures 11 inches long, and the fan power lead is 18 inches. The fan power lead also has both 3 and 4 pin Molex connectors built right in, allowing hookup by either method. Each of the branches at the left are about 8 inches, the entire harness measures about 18 inches in length. The switch controls the CC light, and is a two position slide type switch, mounted on a expansion slot bracket. The inverter has a pair of sockets, allowing connection of a second light, if desired. Installation as a case fan is straightforward. 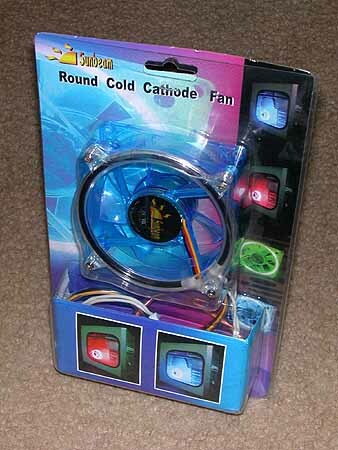 Depending on how you mount it, you may (or may not) need to reposition the light from one side of the fan to the other. This will depend on which way you need the air to blow. mount screws for the light, finger tight is sufficient. I mounted this one up in the blowhole in the side panel of my case. And finally, turning the light on. Having the provision to add a second light is a nice touch. Allowing you to buy only an additional light instead of an entire kit helps keep the end user cost down. This makes the third Sunbeam product I’ve looked at recently, and all of them have impressed my with their quality and value. using several different color options, sound activated light kits, and a choice of front or rear (shown here) mounted switches. can be found among the 750+ (and growing) items in John’s inventory at Jab-Tech. Once again, I’d like to thank John at Jab-Tech for sending this our way.